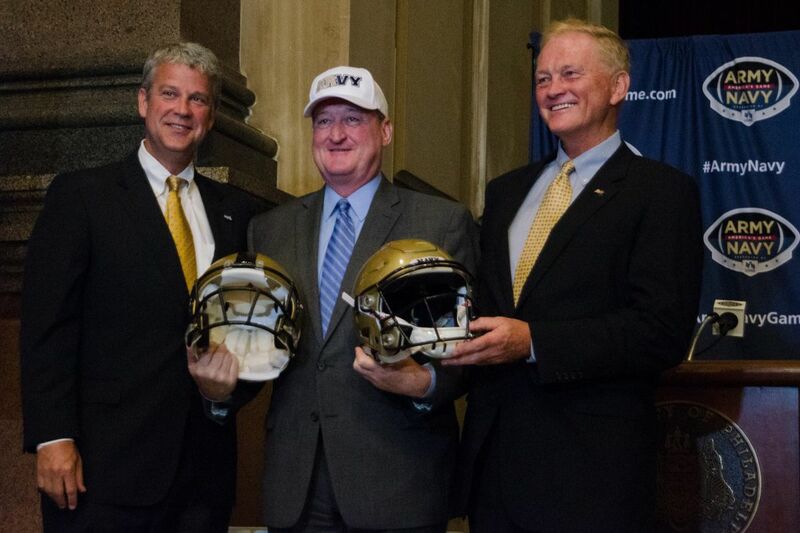 Mayor Kenney, sporting an “Arvy” cap in support of both teams, stands between Chet Gladchuk (left), Navy athletic director, and Boo Corrigan, Army athletic director, at Tuesday’s announcement. The Army-Navy football game will be held in Philadelphia for five of the next six years. The game was already scheduled for this year at Lincoln Financial Field. Philadelphia was announced as the site in four of the next five years, beginning in 2018. The announcement was made Tuesday during a news conference at City Hall. "The Army-Navy game represents the best of what this country has to offer," Mayor Kenney said. This year's game will be Saturday, Dec. 9 at Lincoln Financial Field at 3 p.m. After that, Philadelphia will host the matchup in 2018, '19, '20 and '22. The site of the 2021 game will be MetLife Stadium in East Rutherford, N.J., home of the New York Giants and Jets. A news conference was scheduled for later this afternoon to make that announcement. "We just thought Philly will always get in my judgment, as long as they continue extending themselves the way they do, the majority of the games," Navy director of athletics Chet Gladchuk said. "The anniversary of 9/11 might be something that will resonate with the people in New York City, so that made sense to us to take a year and move it up the street for the 20th anniversary and give New York an opportunity to reflect and do something special." Philadelphia has hosted 86 of the 117 Army-Navy games. Larry Needle, executive director of PHL Sports, a division of the Philadelphia Convention & Visitors Bureau, said the Army-Navy game brings great economic impact to the city. He said a recent study found that the game has an economic impact of $35 million, which includes $2 million in media value. "One of the fantastic aspects of the event is that in the sellout of the stadium you see is 75 percent of those fans are from outside the area and literally 50,000 visitors from across the country who come to Philadelphia to experience the game for the entire weekend," Needle said. Last year, Army won, 21-17, in Baltimore, snapping a 14-game losing streak against the Midshipmen. Now it's back to Philadelphia for four straight years and five of six. "Having the Midshipmen and Cadets back is wonderful," Kenney said. Army director of athletics Boo Corrigan said Philadelphia's proximity to the two service academies and the hospitality of the city are two of the selling points. "Our fans just love being here," Corrigan said. "We feel great about this result," Needle said. "During the last cycle, we were awarded five out of eight [games] and, frankly, that was disappointing." There is intense competition to host the game. Gladchuk said eight cities put in bids this time. "Competition is very stiff," Needle said. "This is one of the world's greatest events and there are many cities out to host it every year and we need to work hard to keep it here where it belongs."